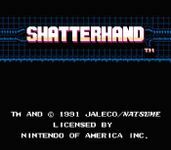 "Shatterhand is a side-scrolling action game for the Nintendo Entertainment System developed by Natsume and published by Jaleco in North America and Europe in 1991. It is an English localization of the Japanese Family Computer game Super Rescue Solbrain​, which was based on the tokusatsu series of the same title; although the license was removed from the NES version, resulting in a change to the game's graphics and plot." Source: Wikipedia, "Shatterhand," available under the CC-BY-SA License.